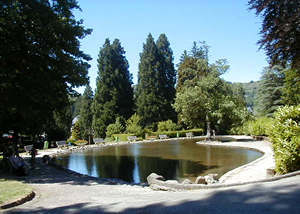 Built in 1874, the Fenestre Park is a landscape garden for leisure in the city centre. There are many trees of different species such as ”Fagus sylvatica purpurera” (38 meter hight), ”Sequoiadendron gigenteum”, a hardy perennial garden containing as many as 200 kinds of plants. Besides, there are playing grounds, skating track, Far West little train, merry-go-round, carousel, poney riding, Guignol, mini-golf, leisure centre and nursery, cafeteria, cabble car. Finaly, a charming little stream called ”le Vendeix” passes trough the park. The Parc Fenestre is a relaxing place for overyone at the heart of ”station oxygène” !